What are pre-test probability, post-test probability and likelihood ratios? Pre-test probability is defined as the probability of a condition being present BEFORE a diagnostic test is performed. 1. Approximation based on previous clinical experience. Ie. IN YOUR EXPERIENCE, how often do patients you see have cholecystitis when they present with RUQ pain. Approximation is vulnerable to random error and bias. 2. Looking at EBM literature where pre-test probabilities have been determined for a wide variety of conditions. Post-test probability is defined as the probability of a condition being present after a diagnostic test. *Key Point– ideally, your goal is to order diagnostic tests that make post-test probability SIGNIFICANTLY HIGHER OR LOWER in order to get closer to definitively ruling in or ruling out a condition. *Key Point– This is the same as the probability of true positives divided by the probability of false positives. Therefore, we want LR+ to be high. The higher the LR+, the greater the amount of true positives compared to the number of false positives. LR+ of 1-2 represents a diagnostic test that is useless in terms of ruling in a condition. LR+ of 2-10 represents a diagnostic test that is of moderate value (it helps to increase probability of a condition but often does not definitively rule it in). LR+ of greater than 10 represents a diagnostic test that of strong value and can often definitively rule in a condition. *Key Point– This is the same as the probability of false negatives divided by the probability of true negatives. Therefore, we want LR- to be low. The lower the LR-, the lower the amount of false negatives compared to the number of true negatives. LR- of 0.5-1 represents a diagnostic test that is useless in terms of ruling out a condition. LR- of 0.1-0.5 represents a diagnostic test that is moderately useful in ruling out a condition (it helps to decreases probability of condition but often does not definitively rule it out). LR- of less than 0.1 represents a diagnostic test that is of strong value and can often definitively rule out a condition. 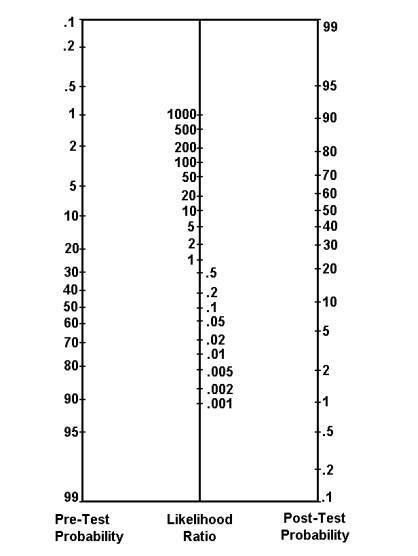 A straight line can be drawn between a known pre-test probability and a known LR for a diagnostic test. This straight line can then be extended onwards until it intersects a post-test probability value. If multiple diagnostic tests are performed the likelihood ratios can be combined by multiplication. However, in order to combine diagnostic tests, they must each be independent of each other (ie. can have nothing to do with each other, cannot measure the same thing). « What are sensitivity and specificity?